“The Lemon Pie Kid” here. The happiest conflict in the history of war is the clash of tart lemons and sweet sugar. If you are what you eat, this kind of sums up what makes me a paradox. So, tell you what. You consume all that aerated flower/eggs/water mix called “cake” and just sort of leave that lemony glurp on the bottom for this here bottom-feeder. Yup. I’ll just take care of things from there. Mmm-hmmm. Yup. For sure. Don’t forget to leave a spoon laying around. Or a shovel. Shovel works. Sully, I thought you might like this one (or at least parts of it)! Don't forget, the cakey layer is very lemony also. This looks/sounds delicious! My wife loves lemony thing and with it being flourless, I think she'll like it even more. Richard, thank you! It does have 3 tablespoons of flour, but she can easily substitute 1 tablespoon each sorghum flour, tapioca flour and potato starch. Oh yum, I think I'm in love! Lemon? Yes please. These look totally delish! I like your suggestions on swapping the flour out. Helpful if you can reduce the gluten. Certainly goes on my list of things to make! Awww, Jacqueline, thank you! I'm sure your kidling would be a joy to me as well as to you! Be sure to tell her to leave a comment sometime (and let me know she's yours). Bob, thanks so much! I hope you'll let me know how they turned out for you. I am a huge fan of lemon and these look delicious!! I would definitely need small ramekins because my 'Full' meter doesn't work well when it comes to anything lemon. Thanks, Judy! I know what you mean--something lemon never feels like too much! I adore a good sweet tangy lemon treat. These look so delicious, Jean. They do look inviting. I do like lemon in certain things..
Angie, thanks! Tangy is good! whiteangel, thank you! I served them to guests last night and they said they were the perfect thing for a hot summer evening. Hello Jean, your lemon pudding cakes sound wonderful. I will have to save this recipe. Thanks for sharing. Happy Friday, enjoy your weekend! PS, thanks for the visit. Thanks, Eileen! I like that it's just made by hand, except for the beating the egg whites part -- and one could do that by hand as well, but my beating arm is having issues! Sweet Jean, these are incredibly beautiful and lemon is such a refreshing flavor. Thanks for sharing with Roses of Inspiration. Have a delightful weekend! Thank you, Stephanie! They go so nicely with one of my yellow tea sets (and that's what really counts, right?!). Thank you, Amy! Whip some up soon! Jean, Thanks for another great recipe! My Pinterest board is overflowing with your terrific contributions. I LOVE lemon pudding cake, and your recipe sounds superb! Carol, thank you so much! AND for the Pins -- much appreciated, especially because I haven't quite figured out how to use it. All my best to you! 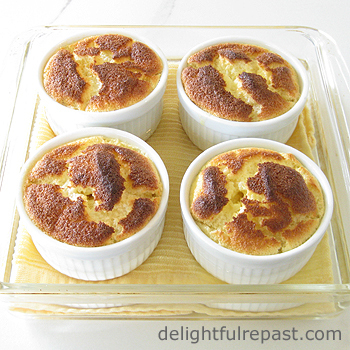 As you know, Jean, I adore lemon :-) Your Lemon Pudding Cakes look gorgeous - I like the individual servings. I make a larger lemon pudding cake from my Grandma's recipe. I like the addition of the cream in this recipe and I'm such a fan of individual serving size desserts. Thank you for being a part of the Hearth and Soul hop. Anything with Lemon is my favorite Jean, I have lemon in my lemon tree,may be I can try this recipe, thanks for sharing with Hearth and soul blog hop, pinning. Thank you, Swathi! I hope you'll like it as much as we do. It's a firm favorite in our family. I have a recipe for lemon pudding cake from a very old cookbook of mine, and I haven't made it in years. Your version looks fabulous, Jean, and I'm like you, in using my toaster oven for smaller batches. Thank you for your visit to my blog. Your comments are always appreciated. Thanks, Kitty! I've been getting a lot of use out of my toaster oven lately -- anything to keep the house cooler! Then put the kettle on, Lucy, I'll bring a batch over! Hi sweet Jean! It's always a delight to have you join Roses of Inspiration. This was such a fabulous recipe that I'm glad you shared it again :) Hugs to you! Stephanie, thanks! I always love looking at all your tea things and crafts. And this is one of my favorite recipes because it goes so well with tea! These look delicious and like the perfect treat at the end of a summer day. Stopping by from the Country Fair Blog Party! Val, thank you! And thanks for letting me know how you found me; I'm always curious about that. We love all things lemon and these look special. I can't wait to try them. Bev, thank you so much! Let me know how they turn out for you. As much as I hate Lemons and Lemon drinks I do like Lemon Cakes and Breads. But not a pie. So yes, I would like to try this as it looks yummy. Plus I know my sister would enjoy it and we could do a Girls Night and make it. TMR, thank you. How I envy you, cooking with your sister for a Girls Night! Enjoy! Thanks so much, creatively! Pins are always appreciated, especially because I haven't quite figured out Pinterest! Okay...true confession time, Jean. I saw this recipe when you first posted it but I avoided opening it because, well you know how I love all things Meyer Lemon...and I've been stuck on the last naughty recipe--no roll crust peach pie/cobbler---and yes, I confess eating it! I was attempting to slow down my consumption of carbs so I didn't want to be re-tempted with yet another fabulous dessert of yours! But here I am, it's Friday and I did it--I opened this post and confess I will be getting the ingredients to make and eat the yummy meyer lemon pudding cakes! Keep it up you temptress of all things good to eat! My hubby loves them too! Sue, now I'm scared! You have some pretty high expectations! :D Thanks so much. Hope you both like this one as much as we do. I am totally new to these wonderful concotions, and lemon is my favorite! I am thrilled you linked up at Country Fair Blog Party!I have this on my list to try this fall, and I can't wait! I look forward to seeing your next adventures on our Oct. Link up! Thank you, Jan! 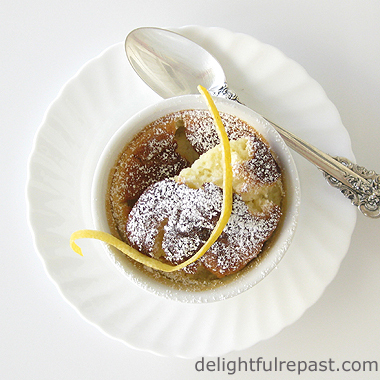 If you like lemon, you should like these puddings! Let me know how they turn out for you.